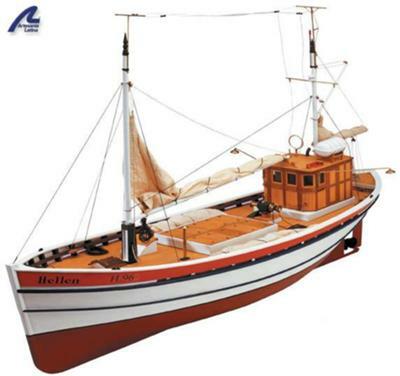 I've built RC sailing boats but the Helen RC Trawler is my first powered model. It's taken me 6 months to find one. The model arrived yesterday but the instructions don't give any info on engine size. Displacement 6kg, length 858mm, beam 240mm. I want scale speed at 2/3 throttle with a little extra in reserve and was thinking about a Graupner 400 or 500. Can you recommend a brushed electric motor size/make, appropriate ESC and a 3 blade prop? Do I need a reducing gear? Other than keeping water out of the hull, any pit falls to watch out for? My aim is to build a replica of INS134 Narinia - childhood thing. Picking a motor for a planing hull boat is easy. If you err on the high side it'll go too fast, but most people probably won't notice. For displacing hulls, such as this trawler, it's a whole other challenge. I get very excited when I see a model boat on a pond. I can appreciate the effort, even if the execution is lacking. But if it's darting around the pond completely out-of-scale, I'm likely to get bored quickly and leave. Sizing a motor is one of the trickiest things about RC scale model boats. Few builders can select a motor, transmission, and propeller combination and get the first iteration to work out. Instead, most of us, have to resort to trial-and-error. The better your first guess, the fewer iterations you'll likely have to go through. This helps finding a solution faster and saves resources. As with so many things in building model boats, there is more than one way to skin this cat. The method I use may not be the best one, but it has given me good enough results that I've stuck with it. The method I use, calculates the power requirement from a full size boat of comparable design. Historic warships are easy - typically the exact performance is well documented. 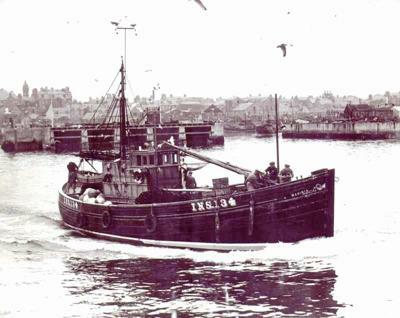 Civilian ships and work boats can be difficult and may require that you use data from a tug to figure the performance of a trawler, for instance. In this case I went to a book called "100 Boat Designs Reviewed". This is essentially a sales catalog for the boat plans offered through Wooden Boat Magazine. One boat that caught my eye is called "Dynamo" designed by the legendary William Gardner - and she looks a lot like a fishing boat. From here we need to be aware that power, as well as displacement, are not scaled linearly, but rather to the third root. As you can see, the beam and weight is pretty much right on. The 40W power indicates that the Graupner 400 should be sufficient. It is rated at 35 to 75W. If you chose the 500 motor, you'll have much more head-room, but may run the risk of having too much power. This can be cured by choosing an appropriate gear ratio. You will definitely need a gear box to swing a scale size propeller. It is difficult to say what the ratio should be, but if I were to guess I'd start somewhere in the 2:1 to 4:1 range for the 400 motor. There is some testing required here. The Graupner motors and accessories are nice, but a bit pricey in my opinion. Something I've started to look into are geared motors for model airplanes. So far I've found the GWS motors exceptional value for money. For instance, the GWS EPS-400C-B can be found online for less than $15. It comes geared and with double ball bearings on the output shaft. The output shaft is a threaded M3 shaft. You may need to get creative to transfer the torque to your propeller shaft. The mounting may need some mods too, but I'm sure it can be worked out. A model this size deserves a nice propeller. It seems as soon as the model boat is out of the water, that's where most peoples eyes goes for some reason. The most attractive investment cast bronze propellers in the world are made by the Prop Shop in the UK (www.prop-shop.co.uk). They are fairly reasonably priced too. Please note that "Left" and "Right" hand are opposite on the other side of the Atlantic when it comes to propellers. I'd ask for their recommendation as to design for the type vessel you are building. Consider buying a prop shaft and stuffing tube while you're at it. They carry a nice line of propeller shafts with bronze bushings as well. As for an ESC, there is no need for anything exotic. There is one waterproof rated at 40A with reverse that comes up on ebay all the time for around $40. It has a blue aluminum anodized case that you'll recognize. That's about it, really. Best of luck with your model boat! Thanks for sharing your Hellen build - some interesting customization - looks great. I'm assuming that's a drip tray under the prop shaft. Great idea. Story is in turkish but pictures may be helpful. Unfortunately 1:20 is not a common scale in any hobby and it seems you have exhausted the most obvious ways to crew your model boat. The second issue is the appearance of the figures. Already at odds in regards to the scale, finding anything that already looks like 1930's fishermen I think is a tall order. I only know of two options for 1:20 scale figures. The first is by Graupner. Unfortunately, there are only a couple of figures available and they are all in bright orange overalls. Hardly your average 1930's fisherman. These figures are painted and ready to go - and priced accordingly. They go for about $8.00 each. The second option is the Tamiya Yamaha yacht crew. I hear they also come assembled and painted and are expensive. The Tamiya F1 "Tire changing pit crew" apparently is the exact same figures - out of the same mold even - but come as a kit, so they cost substantially less. Another close scale, relatively common would be the military action figures of the "Ultimate Soldier" by the company 21st Century Toys. They come in 1:18 scale, which may be close enough. So, there are a few possibilities, but none that is going to be as simple as a fresh coat of paint. What you can do is get one of the options above, but do a more substantial clone. In it's easiest form, you carve away anything you don't want with a Dremel tool. You can add material back by using plumber's epoxy putty that you can get at your favorite home improvement store. If you find there isn't much there to work with, you can save the head, hands and feet and make a wire armature and start adding putty. "Bill Horan's Military Modelling Masterclass" by Bill Horan. "Building and Painting Scale Figures" by Sheperd Paine. I rarely put lights in my models, so I've got limited experience. I try to use the same voltage as the propulsion system. This way any extra batteries or DC-DC conversion is eliminated. LEDs have the advantage that they run cool, so embedding them directly into wood or plastic is no problem. The colored options is another very convenient feature. However, LEDs fry easily if they get too high a current. In addition, the light has a limited beam angle that can be frustrating. Incandescent lights can be found in miniature sizes. My favorite place for all electronics is mouser.com - search for "miniature incandescent lamp". The issues are the opposite to LEDs. Petter - Many thanks for your prompt reply and advice. Had a quick look at the PropShop web site - perfect. Would you know of any sources for 1:20 scale figures (+/-3" high)? I'm looking for figures I can modify to look like trawler crew circa 1930s. Most of the product I've seen are not period appropriate or are too type specific; military, naval, railway passengers. Finally: any thoughts on Running lights - 3V or 6V, preferred source? Presumably I'll have to use brass or alluminium or carbon fibre tubing for the masts to conceal the wires.